Captain G T Anderson, 11th Georgia Infantry, Company H, was appointed colonel, 11th Georgia Infantry, on 2 July, 1861. Captain T L Guerry, 11th Georgia Infantry, Company I, was appointed lieutenant colonel, 11th Georgia Infantry, on 2 July, 1861. Capatin C T Moode, 11th Georgia Infantry, Company K, was appointed major, 11th Georgia Infantry, on 2 July, 1861. The company was accepted in Confederate service at Gainesville, Hall County, Georgia, on 15 May, 1861, and was mustered in Confederate service for the war at Atlanta, Fulton County, Georgia, by Major & Assistant Quartermaster J L Calhoun, Confederate States Army, on 3 July, 1861. The company was accepted in Confederate service at Starkville, Lee County, Georgia, on 29 April, 1861, and was mustered in Confederate service for the war at Atlanta, Fulton County, Georgia, by Major & Assistant Quartermaster J L Calhoun, Confederate States Army, on 3 July, 1861. The company was accepted in Confederate service at Murray County, Georgia, on 21 June, 1861, and was mustered in Confederate service for the war at Atlanta, Fulton County, Georgia, by Major & Assistant Quartermaster J L Calhoun, Confederate States Army, on 3 July, 1861. The company was accepted in Confederate service at Gilmer County, Georgia, on 22 May, 1861, and was mustered in Confederate service for the war at Atlanta, Fulton County, Georgia, by Major & Assistant Quartermaster J L Calhoun, Confederate States Army, on 3 July, 1861. The company was accepted in Confederate service at Fannin County, Georgia, on 14 June, 1861, and was mustered in Confederate service for the war at Atlanta, Fulton County, Georgia, by Major & Assistant Quartermaster J L Calhoun, Confederate States Army, on 3 July, 1861. The company was accepted in Confederate service at Gaddistown, Gilmer County, Georgia, on 1 June, 1861, and was mustered in Confederate service for the war at Atlanta, Fulton County, Georgia, by Major & Assistant Quartermaster J L Calhoun, Confederate States Army, on 3 July, 1861. The company was accepted in Confederate service at Catoosa County, Georgia, on 17 June, 1861, and was mustered in Confederate service for the war at Atlanta, Fulton County, Georgia, by Major & Assistant Quartermaster J L Calhoun, Confederate States Army, on 3 July, 1861. The company was accepted in Confederate service at Monroe, Walton County, Georgia, under the command of Captain G T Anderson, on 19 June, 1861, and was ordered to Atlanta, Fulton County, Georgia, in the morning on 1 July, 1861. The company was mustered in Confederate service for the war at Atlanta, Fulton County, Georgia, by Major & Assistant Quartermaster J L Calhoun, Confederate States Army, on 3 July, 1861, and Captain G T Anderson, 11th Georgia Infantry, Company H, was appointed colonel, 11th Georgia Infantry, on 2 July, 1861, dated 3 July, 1861. Second Lieutenant M T Nunnally, 11th Georgia Infantry, Company A, was appointed captain, 11th Georgia Infantry, Company A, on 3 July, 1861. The company was stationed at Camp Ellington, eight miles from Georgetown, Quitman County, Georgia, on 20 May, 1861, and was accepted in confederate service at Georgetown, Quitman Countiy, Georgia, under the command of Captain T L Guerry, on 19 June, 1861. The company was ordered to Atlanta, Fulton County, Georgia, on 30 June, 1861, and arrived by the Macon & Western Railroad at 8 AM on 1 July, 1861. The company was mustered in Confederate service for the war at Atlanta, Fulton County, Georgia, by Major & Assistant Quartermaster J L Calhoun, Confederate States Army, on 3 July, 1861, and Captain T L Guerry, 11th Georgia Infantry, Company I, was appointed lieutenant colonel, 11th Georgia Infantry, on 2 July, 1861, dated 3 July, 1861. First Lieutenant L P Dozier, 11th Georgia Infantry, Company I, was appointed captain, 11th Georgia Infantry, Company I, on 3 July, 1861, and resigned on 3 November, 1861. The company was accepted in Confederate service at Perry, Houston County, Georgia, under the command of Captain C T Goode, dated 3 July, 1861, and was mustered in Confederate service for the war at Atlanta, Fulton County, Georgia, by Major & Assistant Quartermaster J L Calhoun, Confederate States Army, on 3 July, 1861. Captain C T Goode, 11th Georgia Infantry, Company K, was appointed major, 11th Georgia Infantry, on 2 July, 1861, dated 3 July, 1861, and First Lieutenant G W Wimberley, 11th Georgia Infantry, Company K, was appointed captain, 11th Georgia Infantry, Company K, on 3 July, 1861. "The corps is now in camp at Camp Ellington, about eight miles from Georgetown." "The Walton Infantry is a new Company organised about the first of May, by the election of George T. Anderson, Captain, Henry D. McDaniel, 1st Lieutenant, M. T. Nunnally, 2nd Lieutenant, and E. C. Arnold, 3rd Lieutenant, with a roll of 80 men, rank and file." "Of Georgia Volunteers is now encamped in this city, near Walton's Spring. Capt. Dobbs, Fannin county. Capt. Hyde, Fannin county. Capt. Wood, Whitfield county. Capt. G. T. Anderson, Walton county. Capt. Guerry, Quitman county. Capt. Stokes, Stokesville. Capt. Good, Perry county. Capt. Luffman, Murray county. Capt. -, Gilmer county." "The Lee Volunteers, Capt. Stokes, arrived here on Saturday evening, and left, yesterday, for the rendezvous at Atlanta. the Houston volunteers, Capt. Goode, came up on yesterday morning's train, and departed for the same destination. Last night the Quitman Greys, Capt. Guerry, from Quitman county, arrived, and passsed on to Atlanta by the night train. These three companies will compose part of the 10th Regiment to be organised tomorrpw, in the 'Gate city.'" 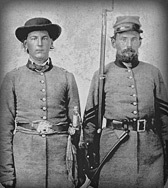 "The Houston County Volunteers, Capt. Geo. W. Wimberly, and the Lee County Volunteers, Capt. J. W. Stokes, passed through this cityon their way to Virginia, last Thursday. They belong to the Tenth Georgia Regiment, recently rendezvoued at Atlanta, and were fully armed equipped." "The Beauregard Rifles, Capt. J. Y. Wood, from Tunnell Hill, and the Walton Infantry, Capt. M. T. Nunnally, from Walton county, passed through this city last Saturday." "The troops will move in the following order for Manassas Junction, viz: Brigade: Ninth Georgia, Colonel Goulding: Eleventh Georgia, Colonel Anderson; Kentucky Battalion, Major Thomas Claiborne, Fifth Brigade; Tenth Alabama, Lieutenant-Colonel Martin; Thirty-eithth Virginia, Colonel Edmonds; Eleventh Alabama, Colonel Moore; Ninth Alabama, Colonel Wilcox; Nineteenth Mississippi, Colonel Mott. The above commanders will send to this office a report stating the total number of men, officers, and servants of their commands who will require transportation." "Words can but feebly portray the feelings of your brother at the end of that long but rapid march, here we were to take the cars to join Beauregard who was at that time fighting the enemy on the memorable plains of Manassas but owing to an accident on the road we failed to reach Manassas until the next day after the fight." "Arrived at Piedmont, the army began to take passage for Manassas. Owing to a collision of the cars three regiments of our brigade, including the Eleventh, were left there until the 22d, and did not, therefore, participate in the battle." "On the 8th of June 1861, the H. C. Vs. then in camp where New Hope now is, marched up in town and formed in front of the Perry hotel, where Miss Mitt Mann, (now Mrs. J. R. Duncan) after an appropriate address, presented the company with a beautiful flag made by the ladies of Perry. Capt. Charles T. Goode received the colors and made a short address in reply. After this the company which was uniformed in white pants and red shirts, had a zouave drill in front of the Hotel." "Since the return of the army from Parksville, the Thirty-third Virginia regiment, organized by Colonel A. C. Cummings, had been added to Jackson's brigade; the Sixth North Carolina to Bee's; the Eleventh Georgia to Bartow's; and a fifth brigade formed, for Brigadier General E. Kirby Smith, just promoted, of the Nineteenth Mississippi, Eighth, Ninth, Tenth, and Eleventh Alabama regiments, and Stannard's Battery. Measles, mumps, and other diseases, to which new troops are subject, had been so prevalent, that the average effective strength of the regiments of this army did not much exceed five hundred men." The Lee (County) Volunteers, the Murray Rifles, the Gilmer Boys, the Fannin Young Riflemen, the Mrs Joe Brown's Boys, the Beauregard Rifles, the Walton Infantry, the Quitman greys, and the Houston (County) Volunteers, were stationed at Walton Springs, east of the Western & Atlantic Railroad, Atlanta, Fulton County, Georgia, on 30 June, 1861, and the 11th Georgia Infantry was organised on 2 July, 1861. Columbus, Muscogee County, & Atlanta, Fulton County, Georgia, Companies B, I, & K, 29 June-1 July, 1861: The Lee (County) Volunteers arrived at Columbus, Muscogee County, Georgia, in the evening on 29 June, 1861, and was ordered to Atlanta, Fulton County, Georgia, on 1 July, 1861. The Houston (County) Volunteers arrived at Columbus, Muscogee County, Georgia, in the morning on 1 July, 1861, and was ordered to Atlanta, Fulton County, Georgia, the same day. The Quitman Greys arrived at Columbus, Muscogee County, Georgia, in the evening on 1 July, 1861, and was ordered to Atlanta, Fulton County, Georgia, the same day. Mustered for the war, Walton Springs, east of the Western & Atlantic Railroad, Atlanta, Fulton County, Georgia, 3 July, 1861: The 11th Georgia Infantry was mustered in Confederate service for the war at Walton Springs, east of the Western & Atlantic Railroad, Atlanta, Fulton County, Georgia, by Major & Assistant Quartermaster J L Calhoun, Confederate States Army, on 3 July, 1861. Atlanta, Fulton County, Georgia, to Richmond, Henrico County, Virginia, Companies B, G, H, & K, 3-12 July, 1861: The 11th Georgia Infantry, Companies B and K, were ordered to proceed by the Georgia Railroad to Richmond, Henrico County, Virginia, in the evening on 3 July, 1861, and Companies G and H on 6 July, 1861. The 11th Georgia Infantry arrived by the Richmond & Petersburg Railroad at Camp of Intruction or Lee, Hermitage Agricultural Fairgrounds, between the Richmond, Fredericksburg & Potomac Railroad and Deep Run Turnpike, two miles northwest of the Capitol, Captiol Hill, Richmond, Henrico County, Virginia, between 8 and 12 July, 1861. Note: The 11th Georgia Infantry, Companies B and K, were stationed at Augusta, Richmond County, Georgia, on 4 July, 1861, and Companies G and H on 6 July, 1861. The 11th Georgia Infantry was stationed at Camp of Intruction or Lee, Hermitage Agricultural Fairgrounds, between the Richmond, Fredericksburg & Potomac Railroad and Deep Run Turnpike, two miles northwest of the Capitol, Captiol Hill, Richmond, Henrico County, Virginia, between 10 and 15 July, 1861. Camp of Instruction or Lee, Hermitage Agricultural Fairgrounds, between the Richmond, Fredericksburg & Potomac Railroad & Deep Run Turnpike, two miles northwest of the Capitol, Captiol Hill, Richmond, Henrico County, to Winchester, Frederick County, Virginia, 15-17 July 1861: The 11th Georgia Infantry was ordered to proceed by the Virginia Central Railroad to Winchester, Frederick County, Virginia, by Special Orders No.221, Paragraph II, Headquarters, Virginia Forces, Richmond, Henrico County, Virginia, in the morning on 15 July, 1861, dated 14 July, 1861, and arrived by the Manassas Gap Railroad at Strasburg, Shenandoah County, via Manassas Junction, Prince William County, Virginia, in the evening on 16 July, 1861. The regiment was ordered to proceed by the Valley Turnpike to Winchester, Frederick County, Virginia, in the morning on 17 July, 1861, and arrived at Winchester, Frederick County, Virginia, at 7.30 PM the same day. Note: The 11th Georgia Infantry was assigned to the Second Brigade, Army of the Shenandoah, under the command of Colonel F S Bartow, 8th Georgia Infantry, at Hollingsworth Grove, east of the Millwood Turnpike, one mile southeast of Winchester, Frederick County, Virginia, on 18 July, 1861. The 11th Georgia Infantry was ordered to Manassas Junction, Prince William County, Virginia, by Special Orders No.1, Headquarters, Army of the Shenandoah, Winchester, Frederick County, Virginia, at 1 AM on 18 July, 1861, dated 17 July, 1861. Hollingsworth's Grove, east of the Millwood Turnpike, one mile southeast of Winchester, Frederick County, to Piedmont Station, Fauquier County, Virginia, 18-19 July, 1861: The 11th Georgia Infantry was ordered to proceed by the Millwood Turnpike to Piedmont Station, Fauquier County, Virginia, at 1 PM on 18 July, 1861, and arrived at Berry's Ferry, on the Shenandoah River, via Millwood, Clarke County, Virginia, at 9 PM the same day. The regiment was ordered across the Shenandoah River at Berry's Ferry, three and a half miles southeast of Millwood, Clarke County, Virginia, in the evening on 18 July, 1861, and arrived at Paris, Fauquier County, Virginia, via Ashby's Gap at 3 AM on 19 July, 1861. The 11th Georgia Infantry was ordered to Piedmont Station, Fauquier County, Virginia, at 5 AM the same day and arrived at 10 AM on 19 July, 1861. Note: Colonel J H Forney, 10th Alabama Infantry, was assigned to command the Fifth Brigade, Army of the Shenandoah, and all troops stationed at Piedmont Station, Fauquier County, Virginia, by General Orders No.1, Headquarters, Fifth Brigade, Army of the Shenandoah, Piedmont Station, Fauquier County, Virginia, on 21 July, 1861 (See the 10th Alabama Infantry). Piedmont Station, Fauquier County, to Manassas Junction, Prince William County, Virginia, 22 July, 1861: The 11th Georgia Infantry was ordered to proceed by the Manassas Gap Railroad to Manassas Junction, Prince William County, Virginia, in the morning on 22 July, 1861, and arrived at Camp Pickens, Manassas Junction, Prince William County, Virginia, in the afternoon the same day. The 11th Georgia Infantry was stationed at Camp Victory, in the vicinity of the F Lewis' Farm, a quarter of a mile southwest of Lewis' Ford, on the Bull Run River, between 22 and 31 July, 1861. Camp Victoty, in the vicinity of the F Lewis' Farm, a quarter of a mile southwest of Lewis' Ford,on the Bull Run River, to Smith's Farm, four miles northeast of Manassas Junction, Prince William County, Virginia, 31 July, 1861: The 11th Georgia Infantry arrived at Camp Bartow, Smith's Farm, four miles northeast of Manassas Junction, Prince William County, Virginia, on 31 July, 1861. Note: The 11th Georgia Infantry was stationed at Camp Bartow, Smith's Farm, four miles northeast of Manassas Junction, Prince William County, Virginia, between 15 August and 11 September, 1861. Surrendered at Appomattox Courthouse, Appomattox County, Virginia, 9 April, 1865: The 11th Georgia Infantry, under the command of Captain W H Ransey, 11th Georgia Infantry, Company H, surrendered at Appomattox Courthouse, Appomattox County, Virginia, on 9 April, 1865. Colonel F S Bartow, 8th Georgia Infantry, Second Brigade, Army of the Shenandoah: Captain F S Bartow, Oglethorpe Light Infantry, Company A, was appointed colonel, 8th Georgia Infantry, on 1 June, 1861, and was assigned to command the Second Brigade, Army of the Shenandoah, at Camp Defiance, Stephenson's Station, on the Winchester & Potomac Railroad, five miles northeast of Winchester, Frederick County, Virginia, on 17 June, 1861. The 11th Georgia Infantry was assigned to the Second Brigade, Second Corps, Army of the Potomac, under the command of Brigadier General S A M Jones, Confederate States Army, on 25 September, 1861. The above painting, 'Never give up the field', is by Don Troiani, modern America's finest historical artist.